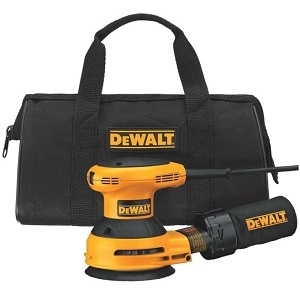 Textured Anti Slip Top And Body Grip, Maintains Controllable Pad Speed And Minimizes Gouging During Start Up, Dust Sealed Switch, Sealed 100 Percent Ball Bearing Construction, High Capacity Dust Bag With Built In Vacuum Adapter, Dual Plane Counter-Balanced Fan Reduces User Fatigue, Accepts 5", 8 Hole Hook And Loop Paper. Specs: Orbits/Min 12,000 OPM, Orbit Diameter 3/32", CFS Pad Break, Weight 3.4lbs. Includes: Dust Bag With Vacuum Adapter, Kit Box.